Try the same basic design as last year, and see if I can get a power supply voltage and pullup resistor settings that work. I’ll have to do this in the lab on campus, because I don’t have a power supply at home that provides the same voltage ranges. Add a driver chip that is intended for driving a pair of FET transistors, like the FAN7382, which can provide very fast rise and fall times even into 1000pF loads. 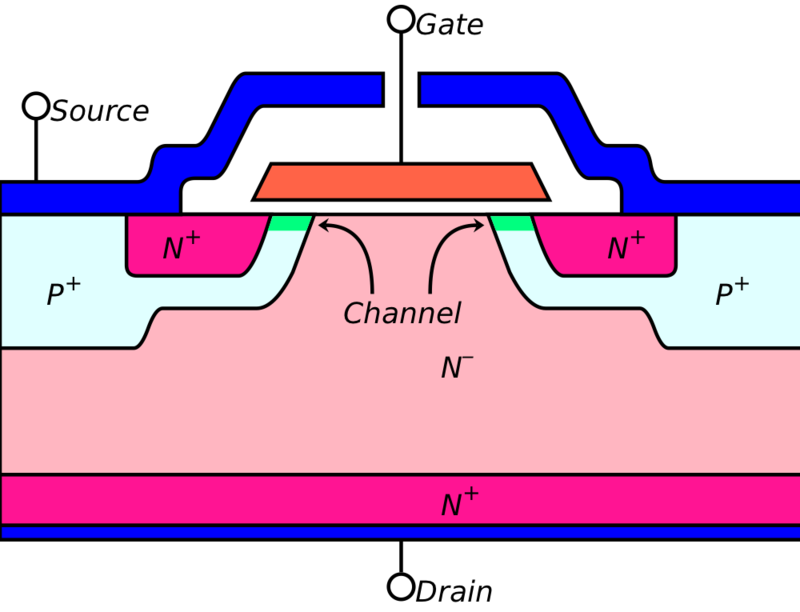 But the driver chips are intended for two nFET transistors, and the charge pump for the high-side driver would be difficult to explain in this course and requires external components (diodes, resistors, and capacitors) that the students would have no idea how to choose. Use an H-bridge or half-H-bridge chip instead of having students design the power stage with FETs. Most are designed for controlling motors, and don’t give timing specs that would tell me whether they could handle a high enough PWM frequency for audio output. Yesterday I ordered some TLC3072 comparator chips and some PSMN022-30PL,127 nFETs, also some MCP6004 op-amp chips, since I seem to have run out, and they are quite cheap. (I probably need more instrumentation amp chips also, but they are more expensive so I’ll probably wait until I really need them). I hope that I can get the TLC3072 comparator chips before lab on Thursday, so that I can test out the circuit before the students need to build it. Otherwise I’ll have to cycle into work over the weekend to test the lab. Digi-key shipped it this evening by first-class mail, which probably means I won’t get it until Friday—when they’ve shipped early Monday morning, I ‘ve gotten things by Thursday. This weekend had me spending a lot of time on the circuits course—I estimate that I spent about 35 hours on the course from Friday night until Monday morning. In addition to figuring out how to rescue and simplify the class-D amplifier lab, I also had to rewrite all the tutorial material for the lab handout, create a quiz for Wednesday’s class, and grade their optical pulse monitor lab reports. The grading is still a bit painful, as some of the students write nearly incomprehensible English and some are still making trivial mistakes on the schematics (like leaving out component values and shorting out components). One error on this round was particularly worth commenting on to the class: consistently using mΩ when MΩ was meant. What is a factor of a billion between friends? About half the class still can’t explain sensitivity and gain computations, even when they get the right answer. In some cases, they probably had not come up with the answer themselves, as they made mistakes that magically got cancelled and disappeared when they reported their final results. They keep such awful lab notebooks though, that it is quite possible that they had done the correct computation at one point, but could not reconstruct their work when they went to write it up a few hours later, so I won’t accuse anyone of cheating. Several students tried to put the op amps before the instrumentation amp. I obviously had not made it clear what an instrumentation amp was for. Many of the students had not gotten the idea that an instrumentation amp is a single symbol in a schematic not a conglomeration of op amps and resistors. This was probably my fault for trying to explain how an instrumentation amp works, rather than how to use one. It doesn’t help that the INA126P data sheet shows only the innards, and not the external view of the amplifier. I think that next year I may skip explaining how an instrumentation amp works internally, though I think it is kind of cool. 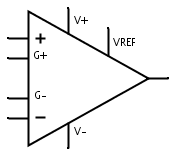 Instrumentation amplifier symbol. 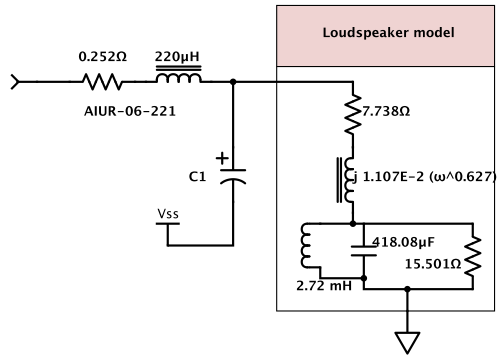 I prefer putting Vref on the bottom, rather than the top of the amplifier, but either way works. I spent a fair amount of time trying to help the students understand the notion of output voltages being referenced to a specific other voltage. I think that next year I will make a point of always writing the gain equations as , so that the output is always a difference between two voltages, rather than as , like I’ve been doing this year. Although the two statements are algebraically the same, I think that they’ll be better able to do multistage gain computations and less likely to forget to connect up Vref if they have the output expressed as a difference. I cleared up some small misunderstandings of how to do layout on the protoboard PDF drawings. At the end of class I collected all the homeworks, and I “graded” them tonight. I’m providing feedback and a done/not-done check, not a grade (which is lucky for them, since most were such sloppily done notes that I doubt that most of the students could reconstruct their thoughts from the notes). I did get a chance to introduce the students to pulse-width modulation and FETs today, which are essential topics for the class-D power amp next week, but I’m not happy with the presentation I gave—I did a better job in the handout, which I suspect most of the students will never read. The problem with working so much this weekend was that I was very tired all afternoon today, and was not able to put together as coherent a presentation as I wanted to. Tomorrow I need to remember to bring in the cheap aquarium air pump, some tubing, and a clamp so that students can observe back pressure and the fluctuations in pressure from the pump (assuming that they get their amplifiers working).